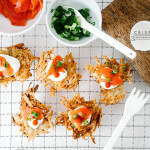 A couple of weeks ago I came up with the brilliant idea of having a brunch cocktail party with a bunch of tiny brunch inspired bites. 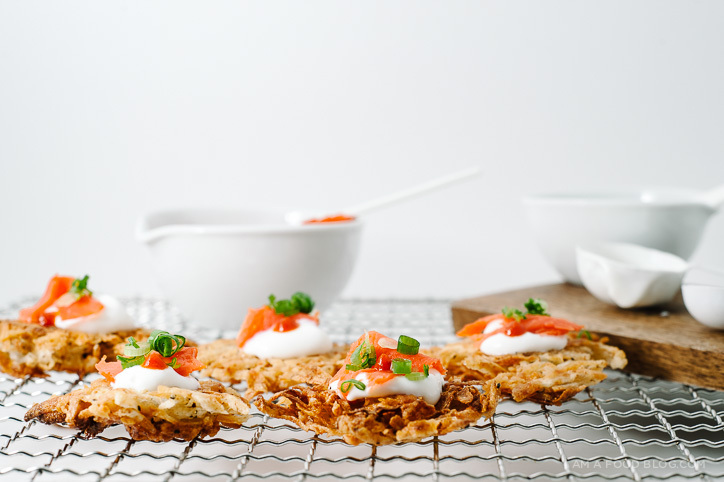 I couldn’t get the picture of a standing-room-only brunch party out of my mind, so I came up with these tiny taro crispy pancakes, a sort of cross between a latke and a Chinese taro cake (the kind you get at dim sum). Taro, like so many other foods, used to be one of my mortal enemies. As a child, it was powdery tasting and just plain weird. I totally did not get my dad’s obsession with it. Usually my mom stewed it, which I found absolutely horrible. Now I’m super fond of taro, in most of it’s preparations (no thank you poi). I can thank those fancy bags of root vegetable chips for my change of heart. I went from being a taro hater to a taro lover with just one crunchy chip. Taro, with its naturally dry consistency, is ideal for frying: a little bit of hot oil and shredded taro turns into a lacy, crunchy pancake. Taro pancakes are delicious on their own, but like latkes, they’re even better with toppings. I finished these guys off with some sour cream, smoked salmon, green onions, and sriracha for a bite full of contrasting textures and flavours. I think they’d be awesome alongside some sriracha bloody Caesars. Happy Sunday! Toss the shredded taro with the flour and season generously with salt and pepper. 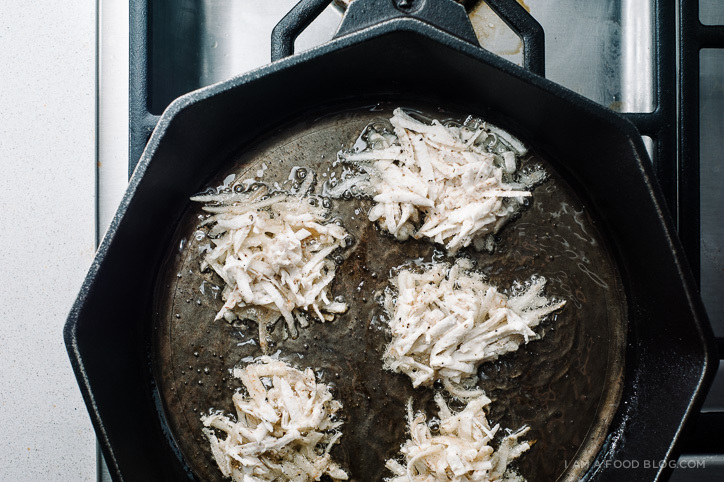 In a heavy-bottomed skillet, heat up 2 tablespoons of oil until hot and shimmery. Drop the taro mixture by the tablespoon and flatten. Cook over medium to medium-high heat until edges are crisp and golden, about 1 1/2 minutes. Flip and cook the other side until golden, about 1 minute. Drain on paper towels. Continue pancaking until taro mixture is done. 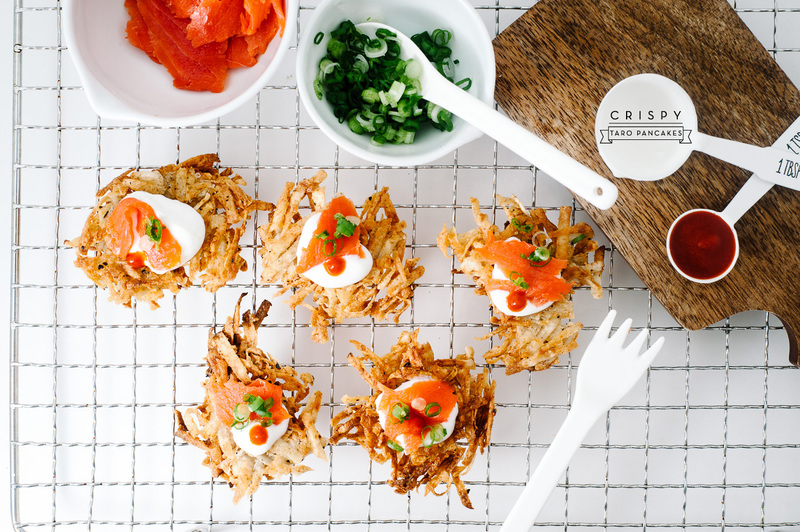 Top pancakes with sour cream, smoked salmon, slice green onions, and sriracha, if desired. Enjoy immediately. That looks positively scrumptious! 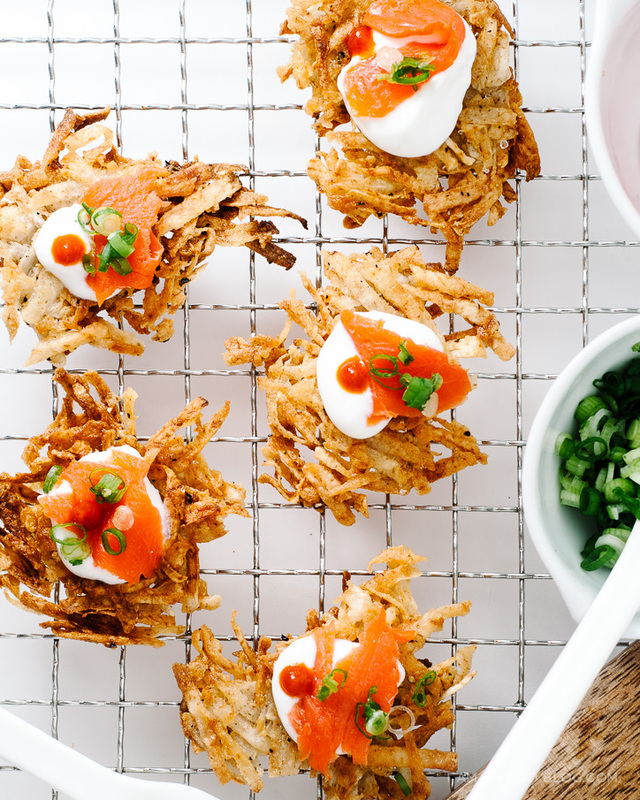 Your take on latkes is super brilliant. Can’t wait to try this. Did you use fresh taro? Do you think frozen shredded taro would work in this recipe (as long as the excess moisture is squeezed out)? i’m not sure if frozen taro would work – i’m guessing it would have too much moisture, even after squeezing out the excess water. 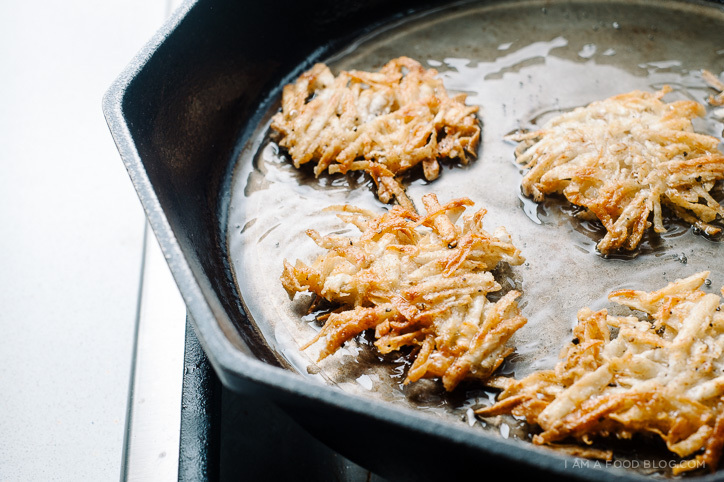 then again, hash browns work from frozen potatoes, so it may work, it just won’t be as crispy. hope that helps! Never eaten or even seen taro!! Looks relish, may have to search it out now. That should say looks delish- the joys of autocorrect!! One day I will make sure you try some really good poi and it will forever change your mind about it!! For now, I’ll just settle for the fact that you just made these awesome little taro cakes!! They sound so great and and want to serve them up with some Portuguese sausage!!! Yum, this reminds me of latkes! I’ve never tried taro but it sounds really good. Looks tasty! I love the sound of smoked salmon on top! This looks divine! I could eat smoked salmon everyday and these little bites look perfect! Love the taro pancake idea too! Oh, that looks so good it makes me hungry!!! Aaaaaaah, something to quell my taro craving when my fave fuzzy football dim sum is out of reach!! Adorbs and super tasty, Steph! So. I’ve never had taro other than the taro chips. And with those, I tell everyone that I love taro, so I feel ya on how great those chips are! Would love to try taro in some other form, like with this recipe. I love this!! Sunday brunch is probably one of my favorites!! This is fantastical!!! I love the way you topped the cakes with those contrasting flavors. It looks super gourmet, but i know your secret….this is easy as pie (fried cake)! This looks really good! Can’t wait to try it! No itchy throat? …isn’t taro supposed to be cooked/boiled or steamed 3+ hours to break down its fibers? i haven’t had a problem with itchy throat – i used a small variety of taro! Can I replace sour cream by something else? absolutely, it’s just there as a sauce/dip component. you could use anything you like!